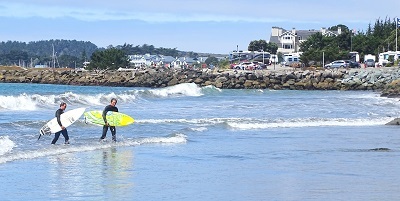 Half Moon Bay, CA - Pillar Point RV Park - Surf's Up! Set after set of amazing waves are pounding the shore here at Pillar Point RV Park! Forecast says the waves will only be getting bigger all week, peaking this weekend. The sound of the waves is deafening and some of them come in so hot, you can feel your rig shake. It's breathtaking as the waves hit the jetty and fly up into the sky. It's a spectacular day at Pillar Point RV Park.